If you’ve ever wondered what the relationship is between meditation and anxiety relief, then this will help. Anxiety and panic attacks are a symptom of the mind excessively worrying about something that may or may not be an actual threat. Worry tends to be future based as the mind projects an imagined reality into the future and then obsesses over it as if it were real. To many people, the fear of the imagined future event or outcome is all too real. The anxiety comes when your emotions get hooked into the equation. Once you start feeling fearful about the future you are imagining, then the body responds with anxiety. Some of the physical symptoms that arise from anxiety include things like shortness of breath, sleep disorders, tiredness, moodiness, tension, eating and digestion problems, and even loss of confidence. It’s easy then to see how anticipating the worst can have a negative impact at home, work and in your everyday life. Will Meditation Help My Anxiety? Well, the answer is yes and no. There’s a lot of things that can potentially help with anxiety but for any of them to work a different approach to solving it will be required. 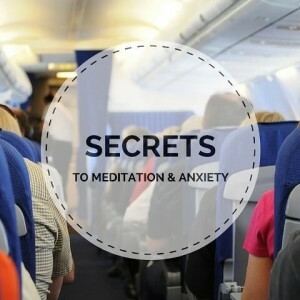 What I mean by this is that meditation is a powerful tool to help reduce anxiety but not in the way you might think. Thinking is the friend of anxiety and the more you think about how to get rid of it, the more you will become anxious as thinking leads to anxiety. So to sit down and try and meditate to ‘get rid’ of anxiety while you are anxious will just make the mind more anxious – not less. Instead of fighting with your thoughts, just be aware of them. Close your eyes and watch your thoughts come and go across the screen of you mind. If it helps, you can even write down the thoughts you are having onto a piece of paper. All your doing here is allowing the energy that’s underneath the fearful thoughts to be free to move uninterrupted. While watching your thoughts come and go, if you notice that your mind has wandered and you are having any feelings or physical sensations arise, accept them as well. These are all perfectly natural and the only difference is that when you notice them, gently bring your awareness back to watching your thoughts and feelings. The more you practice the skill of being able to watch your thoughts and feelings without getting caught up in them, the more centered and at peace you will feel. At first you may only be able to do this for a minute or two. That’s okay – that’s a great place to start. From there, do your best to increase it by one minute at a time until you can comfortably sit and watch your thoughts for 20 minutes at a time. Once you can do that, then you’ll find that anxiety will have a massively reduced stranglehold on your life. Like anything, the more you work at being able to be mindful of your thoughts and feelings, the less impact they will have to cause you any suffering. The only time we ever suffer is when we believe in the nonsense that the mind tries to tell us is true – when it’s not. The secret ingredient to being anxiety and worry free is to spend more time being centered. When we step back from the busy or frantic mind and just give ourselves a little space to quiet the mind and get out of our head, then centering happens automatically. Anything you can do to help get you out of your head and into your body will help. That includes dancing, running, swimming, or any movement at all that you can relax into it and forget about yourself while you do it. The more you can let go of the mind while doing anything, the deeper you will feel centered.